LONDON, July 17, 2018 /PRNewswire/ -- Raytheon Company (NYSE: RTN) will produce, test and deliver 44 Standard Missile-3 Block IB interceptors under a $466.9 million U.S. Missile Defense Agency contract. This is the fiscal year 2018 contract under the initial 2015 contract announcement of $2,351,177,872 for planned SM-3 fiscal year 2015-2018 production. 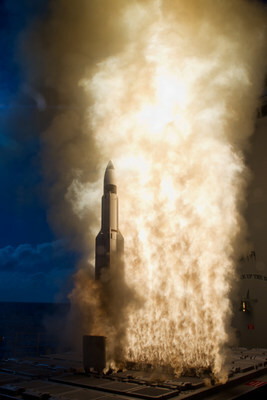 The U.S. Navy uses the missiles to provide regional defense against short- to intermediate-range ballistic missiles. The SM-3® Block IB interceptor has a two-color infrared seeker and upgraded steering and propulsion capability that direct the missile toward incoming targets, destroying them on impact in space. "Standard Missile-3 plays a critical role in the missile defense of the U.S. and its allies," said Dr. Mitch Stevison, vice president of Raytheon's Air and Missile Defense Systems. "The missile's deployment on land and at sea makes it invaluable to upper-tier missile defense in Europe and for U.S. naval forces." The SM-3 IB interceptor was most recently tested in a multinational operational exercise off the coast of Scotland, where it intercepted a medium-range ballistic missile target. The IB variant is operational at a land-based site in Romania. Production under this contract will be completed at Raytheon's Space Factory in Tucson, Arizona, and integration will take place at the company's integration facility in Huntsville, Alabama.